I've been severely reprimanded -- for neglecting to mention that my two youngest, adorable, precious daughters were with me during my R&R break. Sorry Laura and Bec. I've also been scolded for not including more pictures. Last week on our tour to the Kuwait Towers -- here's what they look like. The tower with two spheres is the restaurant on the bottom and the viewing tower in the top sphere. The tower with only one sphere is a working water tower. 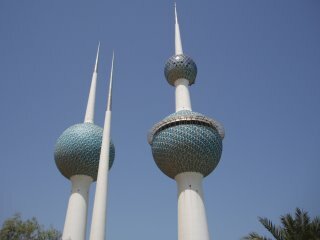 They're lit up at night and very beautiful -- the Kuwaiti's are extremely proud of their towers. We went s hopping while in San Antonio. This (believe it or not) is a pillow. If you've not been shopping with my daughters and me, you've missed a great experience. Someone always has a camera in their purse, and we always have some great kodak moments to remember the excursion. Ha Ha! You don't post for a month and then you get scolded for not doing it right! Glad you're back in cyberspace!